Being a pastoral musician, when it comes to the Liturgy of the Word I am drawn to the responsorial psalm appointed for each Sunday. Looking back to last year (Year A), the appointed psalm for the second Sunday of Advent was Psalm 72, with the refrain, “Justice shall flourish in his time, and fullness of peace forever.” This is a tough one to understand, being one of the kingship or messianic psalms, but at the core of its message is the description of a utopian or perfect society, where justice, peace, economic security, “flourish.” The enthronement of the king involves his holding responsibility to be the mediator, or ambassador of God’s restorative justice and blessing upon the people. Its connection with Advent and the birth of Jesus is clear as the psalm speaks to the earthly king to come, the long awaited Messiah. But what we celebrate during this season is a two-fold coming; we celebrate the historical birth of Jesus, but we also wait and ache for the coming of the messianic presence at the end of time. We believe the incarnation to be true indeed, but at the same time, we are still waiting. We wait for this justice and peace to be real and flourishing, and we believe that it will happen, as I paraphrased in my musical setting of this psalm, “In the time of God.” On the recorded track of this song (that appears on the CD collection, “Throughout All Time” from GIA Publications), the tempo, unintentionally, speeds up and rushes a bit. Now, most of that I would attribute to my adrenalin pumping up while playing the piano, but I would also like to assert (so it would seem intentional) that it signifies the excitement and anticipation of the season … well, I gave it a shot. Nice try, David. Advent has always been a favorite time of year for me, because, I guess, I am always in a state of waiting – so this is most certainly my season! I also love this season because of the fact that it seems so impossible to celebrate in a culture where Christmas begins around Halloween! That may seem contradictory, but I am attracted to Advent because it is so subversive; it challenges us, if we quiet down our lives enough to hear the message, to, as Paul Simon would say, “slow down, you move too fast.” I should have thought about that and had a metronome next to me when I recorded the song. 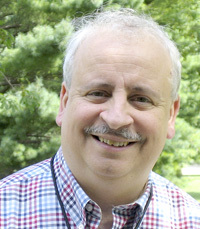 David Haas is a widely published composer of liturgical music and author of several books on prayer and spirituality. Follow him on his Facebook page.